Las obras de Roberto Bolaño » Blog Archive » What’s left of Bolaño? After A Little Lumpen Novelita was released in English last year, it’s worth considering how much of Roberto Bolaño’s writing remains to be published or translated. Have we seen all we will see in English of Bolaño? After even a cursory round of research, the answer is likely no. I will try to enumerate all the possibilities for unpublished or untranslated Bolaño works below. There is not a 1-to-1 correlation between Bolaño’s books in Spanish and his books in English because many of the stories and poems were grouped into different collections (with different titles) and, in English, Between Parentheses collected a lot of material that was published in various forms in Spanish. 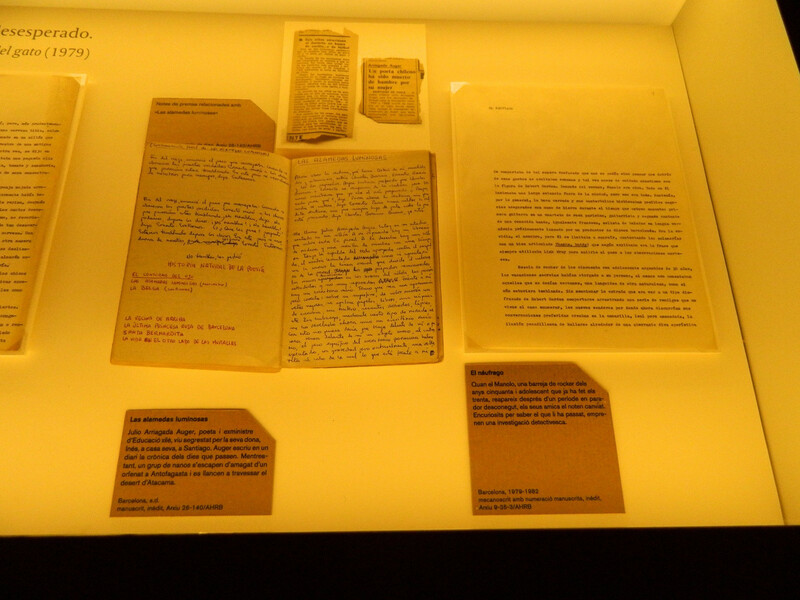 This article mentions some of the same unpublished works have these titles (only four of which are novels–the rest are short stories): Lento palacio de invierno (1979), Tres minutos antes de la aparición del gato (1979), Las alamedas luminosas (1979), Las rodillas de un autor de ciencia-ficción, atrás (1979), El náufrago (1979-1982), Ellos supieron perder (1979-1982), La vírgen de Barcelona (1980), El contorno del ojo (1979-1982), El espectro de Rudolf Armand Philippi (1982), Adiós, Shane (1983), D.F, la paloma Tobruk (1983), Diorama (1983-1984), El espíritu de la ciencia-ficción (1984), El maquinista (1986), Última entrevista en Boca-cero (1995-1996), Sepulcros de vaqueros (1996), Todo lo que la gente cuenta de Ulises Lima(1996-1997), Vuelve el man a Venezuela (1999), Corrida (1999-2000), Comedia del horror de Francia (2001) y Dos señores de Chile (2001). Many of these titles overlap with the chart above and we can see where they fit in, but none of these after El Maquinista appear in the chart (and some have been published in the time since). Let’s break this down and see if we can make sense of this list. Since there isn’t much concrete info on any of these, I am going to speculate wildly about many of them, based solely on the title and date. 1. Lento palacio de invierno [Slow Winter Palace] (1979) – A short story, 13 pages long, about a day in the life of an illegal immigrant in Barcelona. 2. Tres minutos antes de la aparición del gato [Three minutes before the appearance of the cat] (1979) – No info. 3. The bright malls [Las alamedas luminosas] (1979) – According to this photo from Archivo Bolaño, this book was inspired by two newspaper articles: one about six children crossing the desert in search of love and futbol and another about a Chilean poet named Julio Arriagada Auger who was “starved to death by his wife.” You can see some of the text here. 4. Las rodillas de un autor de ciencia-ficción, atrás [Knees an author of science fiction, back] (1979) – No info. 5. El náufrago [The Castaway] (1979-1982) – This report from the exhibition says that the first line of it is “Se comportaba de tal manera desfasado que uno no podía sino pensar que detrás de esos gestos se ocultaban semanas y tal vez meses de cuidado mimetismo con la figura de Robert Gordon”. (Roughly translated as “He behaved in such an outdated way, but no one could think that behind these gestures weeks and perhaps months were spent hiding with care the mimicry of the figure of Robert Gordon”.) You can make out more of the text in this photo. 6. Ellos supieron perder [They were able to lose] (1979-1982) – No info. 7. La vírgen de Barcelona [The Virgin of Barcelona] (1980) – Very little info. 8. El contorno del ojo [The Outline of the Eye] (1979-1982) – Possible reference to Georges Bataille’s Story of the Eye? 9. El espectro de Rudolf Armand Philippi [The Spectre of Armand Rudolf Philippi] (1982) – Rodolfo Armand Philippi was a German naturalist and scholar based in Chile. He helped found the National Museum of Natural History in Chile. Apparently this is a book-length manuscript. 10. Adiós, Shane [Bye, Shane] (1983) – Possible reference to the film Shane? 11. D.F, la paloma, Tobruk [DF, The Pigeon, Tobruk] (1983) – Tobruk is a city in Libya, the site of a WWII battle, which was the inspiration for a WWII hex-style boardgame called Tobruk. Bolaño famously wrote about WWII boardgames in The Third Reich. But D.F. is Mexico City and Tobruk is also a Rock Hudson war movie. According this article, it is one of the four unpublished novels. I would be very interested to know more about this book. 12. Diorama [Diorama] (1983-1984), First mentioned on this site in 2009; also mentioned here. This is one of the four unpublished novels. 13. El espíritu de la ciencia-ficción [The Spirit of Science Fiction] (1984). 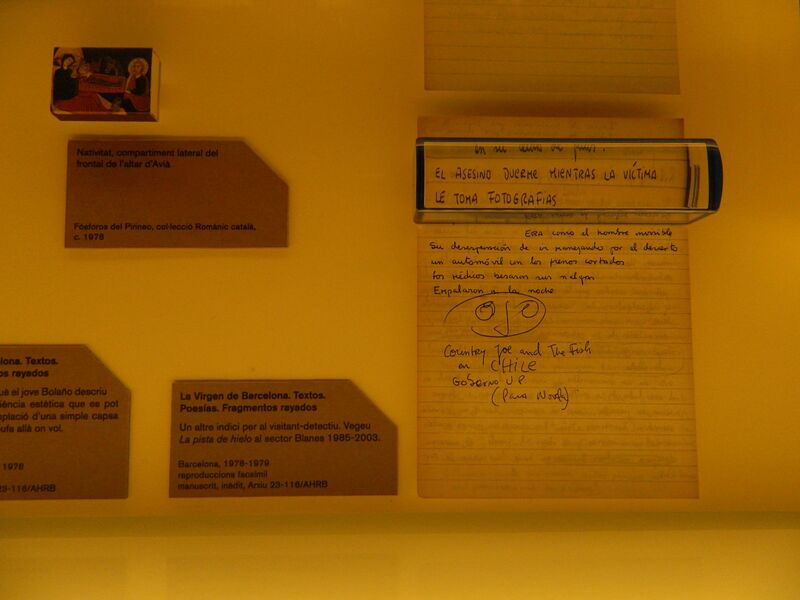 The Archivo Bolaño exhibit featured a large collection of Bolaño’s personal science fiction paperback collection. No doubt Bolaño was deeply influenced by the expansiveness of science fiction, especially as a younger writer. This also appears to be a novel and not a short story. I would imagine that the other stories here, if they are deemed suitable for publication and not mere juvenilia could be grouped together into a separate volume. 14. El maquinista [The Machinist] (1986) – No info. 15. Última entrevista en Boca-cero [The Last interview in Boca-cero] (1995-1996) – Melville House published a book called The Last Interview but it’s not clear if this is the same thing. The dates don’t match, for one, and I have a feeling this Boca-cero is a novel not an actual interview with Bolaño. I’m not sure what “Boca-cero” is. Boca is the best-known futbol team in Argentina and cero means zero, but is it also a place? The last interview in a town called Boca Zero? 16. Sepulcros de vaqueros [Graves of the Cowboys] (1996) – No info. 17. Todo lo que la gente cuenta de Ulises Lima [Everything that people think about Ulises Lima] (1996-1997) – Lima is, of course, a key figure in The Savage Detectives and Bolaño’s fictional universe. The fact that he was writing about Ulises Lima (who is based on his friend Mario Santiago Papasquiaro) in 1996 corresponds roughly to the time he was also composing The Savage Detectives. It’s not clear if this is an excised section of that novel or something separate. 18. Vuelve el man a Venezuela [The man returns to Venezuela] (1999) – No info, but this is around the period that Bolaño returned to Chile. Much of his writing about that trip is collected in Between Parentheses as “Fragments of a Return to the Native Land.” Not sure if this a fictionalization of that trip or something else entirely. 18. Corrida [Run] (1999-2000) – No info. 19. Comedia del horror de Francia [French Comedy of Horrors] (2001) – No info. 20. Dos señores de Chile [Two Gentlemen of Chile] (2001) – Likely refers to Ulises Lima and Arturo Belano, but could also be a reference to Two Gentlemen of Verona? AND YET, there are at least two short novels that have been published in Spanish but not yet translated into English. 21. Consejos de un discípulo de Morrison a un fanático de Joyce [Advice from a Morrison Disciple to a Joyce Fan] – Written in collaboration with Antoni Garcia Porta, this was Bolaño’s first published novel (1984). This article describes the novel as “A noir account of an unlikely crime spree undertaken by a Joyce-obsessed Spanish writer and his South American girlfriend over a long Barcelona summer.” It is divided into 24 short chapters with an appendix titled “Manuscript Found in a Bullet: The Journal of Angel Ros.” So far it has not been translated into English. There is no doubt that the information about unpublished Bolaño works is more comprehensive in Spanish. And I’m not a native Spanish speaker so I am relying on my own translations or Google Translate for a lot of this text. Bolaño has received much more attention and scholarly work in the Spanish-speaking world than the English-speaking world. THIS ARTICLE says that “The list [above] may seem tedious (and it is), but so is reading the displayed excerpts of original manuscripts: except for some posters of introductory works that provide a brief gloss (only in Catalan, causing foreign consternation in the exhibition) for visitors, there is nothing here that to infer if the observer is facing a novel or a story, if the story or novel is unfinished and was completed by the author and if it was considered a quality text or a discard.” So there is still lots of work to be done on Bolaño’s archive and the work has only just begun. If you have information about any of these titles, email me and I’ll add it. This page took 0.374 seconds of computer labor to produce.